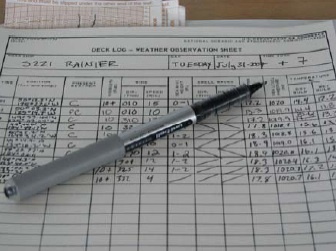 Weather log on the RAINIER. Data is gathered, then entered into a database. The RAINIER started its work in South East Alaska in April of this year. Four months and hundreds of nautical miles later it was time to leave: Juneau, Ketchikan, Sitka, Baranof Island, and the Gulf of Esquibel. Three or four research boats were in the water everyday rain or shine, calm or rough water, gathering data. At night, crews’ maintained watch, reviewed data, and planned for the next day’s work. Equipment was checked to ensure everyone’s health and safety. 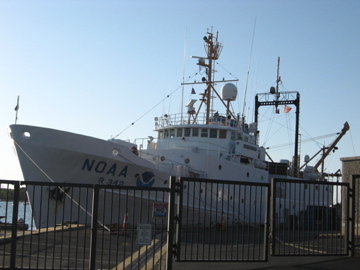 Quality control ensured that the data gathered met NOAA’s expectations. 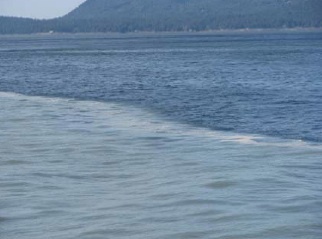 Now it is time to end the Alaskan part of their work and move to their next working location. While traveling from South Each Alaska to Washington I reflected on the most memorable parts of the journey. I immediately remembered the compliments from pleasure boaters and fishermen about NOAA’s work. Next I thought about the ease at which the crew safely delivered and returned their equipment and crew to and from the ship each day. Then I thought about the NOAA resources I learned about as I studied information about hydrography, technology, satellites, weather, and tides. And how could I not mention the food – it was great. Good food compensates for the sacrifice of being away from home for such a long time. Water from the Fraser River (green) and the southern end of Georgia Strait waters. There would be a short break between the end of this voyage and the start of the next, some would remain on the ship, and for others it meant being “at home” for the first time since April. This is part of the sacrifice that mariners, and those who explore the oceans make. As we traveled closer to home many off-duty crewmembers gathered on the fly deck to see home slowly approaching from the distance. 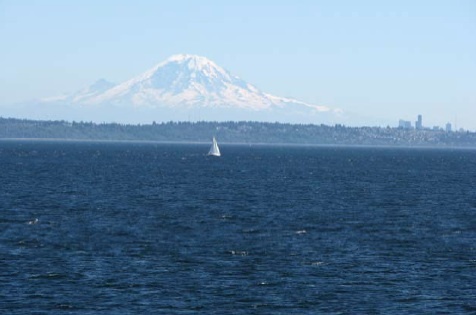 They shared stories from the last four months and recalled the moments of laughter on “the big white ship.” After traveling through Canadian waters, around Vancouver Island and into Puget Sound, people began to gather in earnest of the desk. At first I thought it was because we were taking a picture for a “NOAA 200th Anniversary Postcard from the Field,” but many remained on deck. Many were anxious for the first glimpse of their families and their homes. Many of their family members arrived at the Ballard Locks – waving and communicating their excitement about the reunions that would happen in a few short hours. Mt. Rainier and Seattle in the distance. The sun is setting as we traveled past the many marinas for all types of marine vessels, houseboats, and dry-docks. 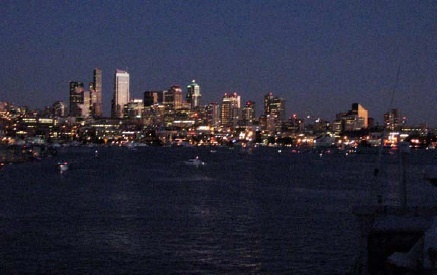 As we passed through crewmembers neighborhoods the fading sunlight was replaced with light shining in their eyes as they talked about the view from their windows, their favorite neighborhood haunts, and local treats that mean “home.” As we turn toward the waters that lead to downtown Seattle the crew on the fly deck is silent. The last embers of sunlight are reflecting on the downtown Skyline, it is spectacular. We turn away from downtown and travel through the Fremont Cut. Thank goodness for the navigational skills of this young and talented team – the water traffic from Seattle’s SeaFair was busy. Once we arrived at the NOAA Western Regional Center in Sand Point, CO Noll’s work was done. 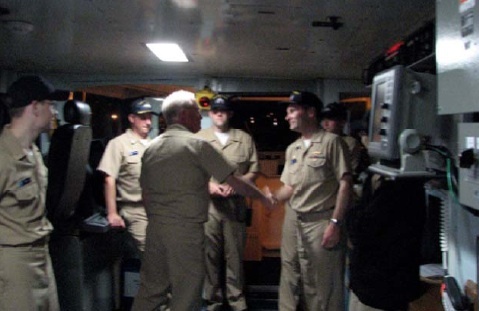 He had trained his crew to successfully navigate the ship and complete the mission. We are all home; the final navigational command is given. “All Engines Stop” “All Engines Stop, Aye. – All Engines Stopped” “Very Well.” Rear Admiral De Bow was on board to congratulate him, and pass the time-honored command coin. I hate to admit it, but like a kid at camp leaving a new set of friends knowing that I most likely will not see many of them again, I feel sadness. The memories and lessons will remain. What a great adventure for a teacher, what a great experience for those who work on the ship, and what a great service provided to those who depend on navigation for commerce, recreation, and those who seek a greater scientific understanding of the earth and how it changes. I can’t wait to share it all with my students and colleagues!!!! The past few days have been kind of crazy on the ship. Two days ago we did a fire drill and an abandon ship drill. We did these drills the within the first few days of our cruise and I got lost trying to get to my correct area for the abandon ship drill. But this time, not a problem. First we did a fire drill. They sounded the horn and let us know it’s a drill and all the scientists report to the same area where wait for word from the bridge to release us from our drill. While we were waiting, the crew suited up in the gear they would need for a real fire and the Executive Officer, or XO, Nathan Hancock, picked me and one of the other scientists to help out with the fire hose. I was up front and held the nozzle while the other scientist supported the hose. That was my very first fire hose experience! Next we did an abandon ship drill. Everyone on board is assigned a specific area to report to and you must bring with you few items: your survival suit for cold water, a long sleeve shirt, long pants and a hat. Once everyone has reported to their area, we wait for word from the crew to let us know we can head back to the lab. Then yesterday, we did a man overboard drill. To simulate a real man overboard situation, the crew threw a dummy into the water, sounded the man overboard alarm and alerted everyone that there was a man overboard on the port (left) side. The scientists all report to the same area and have the important job of being the eyes for the crew while they ready the rescue boat. For this drill, we stood up on deck and pointed in the direction of the man overboard as the crew deployed the rescue boat and headed in the direction we were pointing. We did that until the rescue boat was in view of the man overboard. I liked watching the crew in action and seeing how well they worked together. Last night I was able to visit the bridge to see how they run everything up there. My shift was over and the night shift was getting set up to do their first station of the night. I asked if I could stick around and watch them do a station so I would know what it’s like from the perspective of the officers. It was very cool. And then we had our last full station today. I finished my last bongo, Neuston and CTD tonight. We will be doing some more methot samples as we head home for me and some other teachers to bring to their classrooms. So we aren’t completely done with everything, but the cruise is definitely winding down. Last day of stations was today! This is exciting because it means that we successfully finished the leg of our cruise. But at the same time it’s sad because that means I will be going home soon. And I just figured out how to get everywhere on the ship. As educational and fun as this has been, I am excited to get home. I have so many stories that I can’t wait to share with everyone and hopefully inspire some of my co-workers to get involved with experiences like this. Visibility is how far ahead you can see from the ship. On a very foggy day you may only have a visibility of 10 ft whereas on a clear day you can see all the way to the horizon, or 12 nautical miles. Wind direction tells you which way the wind is blowing from: 0° is north, 90° is east, 180° is south, and 270° is west. Sea level pressure (or Barometric Pressure) indicates what the trend of the weather has been. High barometric pressure usually means sunny weather and rain can not build up in clouds if they are being squeezed together by high pressure. Low barometric pressure means rainy or stormy weather is on the way. Present Weather is a description of what the day’s weather is. Field Party Chief or FPC is in charge of the team of scientists on board the ship. This person oversees all activities having to do with collection of samples and is the go to person in case anything goes wrong that the scientists can’t handle. They also act as an extra set of hands when needed. personnel about when the nets have hit maximum depth. They keep watch in case anything goes wrong underwater. Deck Scientist is the scientist out on deck getting the nets ready, rinsing the nets, collecting and preserving samples. They are the eyes on deck in case anything goes wrong at the surface or on deck. Neuston Net is one net 1 X 2 meters with a 947 micron net. Neuston samples are done only at the surface and placed in the water for ten minutes. The Bridge is the navigational hub of the ship. 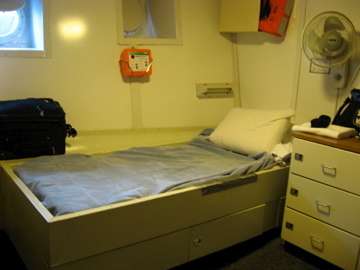 This is where the officers steer and navigate the ship and where all the equipment is located to help them to do so. 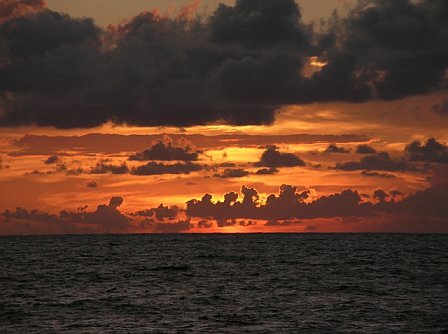 It is usually the top deck on ships to give the crew the best visual of the water. XO or Executive Officer is the second in command to the CO. 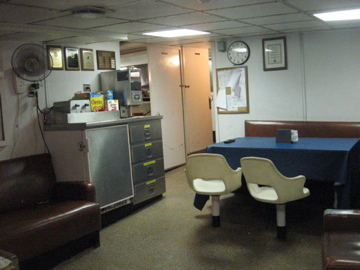 The XO is responsible for the administration of the ship, supervising department chiefs as well as all officers. They are also responsible for the budget. Today I took my first CUFES sample. CUFES stands for Continuous Underway Fish Egg Sampler. The purpose of this is to map the distributions of fish eggs along our cruise path and the samples are collected every 30 minutes. Basically what happens is there is an intake pump at the bow of the ship to collect water at the surface. From there the water pumped into a collector where the water is run over a sieve to catch any eggs. We preserve the eggs for ID back at the lab on land. This is something that usually just the lab scientist handles, but they allowed me the opportunity to try it out a few times. Along with collecting all the samples, all the information about latitude and longitude, time, and sample number must be input into the computer to collect all the information needed to map the distribution once the numbers have been collected. Since I have been working as a deck scientist since we started stations, the FPC (Field Party Chief) offered me a chance to stay inside and to see what the lab scientist does while we are working out on deck. This way I would get to see both sides of the collection process. We got the 10 minute to station notice from the bridge, the lab scientist started filling in station information into the computer. She inputs longitude and latitude, time, sample number, and station number in databases for each of the different sample methods. 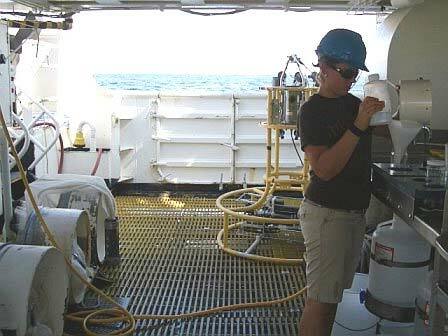 For this station we were doing bongo, Neuston and CTD sample collections. Once we got the OK that the deck and bridge were ready, she sent out the OK that she was ready and the deck got started placing the bongo in the water. She let them know the final depth they were going to give them an idea of how long the collection will take. The sensor that goes in with the bongo relayed all the information about depth back to her. Once we hit maximum depth, she gave them the “all stop” and they started hauling it back in. The Neuston involves the same information being entered into the computer but all she needs to relay to the deck personnel is the 2 minute warning and so they could start hauling the net back in. The CTD seemed very complicated so I just sat quiet and tried not to ask too many questions and distract her. For this the graphs on the screen displayed everything that the CTD reads and as they lowered into the water column I watched as the graphs collected all the data. She let them know how deep to go, when to pull it back up and how long to leave the CTD at each depth. She also fired the three bottles to collect water for chlorophyll measurements. They brought it back on deck and that was it for this station up in the lab. I am very thankful that I got put on a cruise with such a great team of people. Between the crew and scientists, everyone has been so helpful and accommodating. The FPC always goes out of his way to take pictures for me, explain things further and give me opportunities to experience everything the scientists do. Coming on as a volunteer I wasn’t sure how much of the different tasks they would allow me to do, but they have been great explaining everything and showing me the different things. They have also been helpful showing me different techniques when rinsing samples and helping me out with the different ship terms and names. Lab Scientist is the scientist that stays in the lab to work the computers recording the data on sample time, sample depth, station number, sample time and is the one that relays information to the deck personnel about when the nets have hit maximum depth. They are the eyes underwater. CTD stands for conductivity, temperature and depth. It is lowered into the water column to get salinity, chlorophyll, dissolved oxygen and turbidity readings at the stations. There are three bottles that are attached to the CTD to take water samples at the surface, mid layer and bottom of the water column at that station. Today we had the opportunity to try out two new sample methods. One method is along the same lines as the bongo and Neuston sample but this one is called a methot. A methot is 2.32 X 2.24 m frame with 1/8” mesh netting. The total length of the methot net is 43 feet. It’s huge! 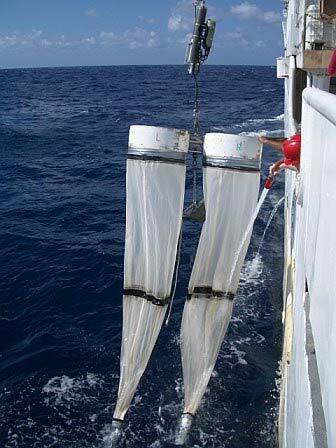 It works just like regular plankton net where it has a large opening and then as it moves towards the end it becomes more and more narrow and eventually ends at a collection container. The reason this is my first time doing one is because they are usually done only at night and since the net is so large they must be done in fairly deep water. The deck personnel helped us put the net in the water and then we waited. As the net was brought back on deck, we rinsed it down and collected samples the same way we would a bongo or Neuston sample. Of course with such a large net we collect bigger animals that we would with the other two. We did collect some fairly large fish along with smaller larvae. Our collection wasn’t the most excited some of the scientists have seen but to me, it was very exciting. The second collection we took wasn’t a plankton collection but a water sample. It is important to know the physical and biological parameters of different areas when collecting. For this, we used a very large (and expensive) piece of technology: a CTD which stands for conductivity, temperature and depth. The CTD also measures dissolved oxygen and can do all of these measurements without actually collecting any water. We do however collect water to look at chlorophyll levels. The CTD frame has three bottles attached to the frame to collect water throughout the water column. Once we open the bottles on deck and set them, the lab scientist has the capability to fire the bottles shut at different depths. All measurements and water collection happen at three areas in the water column. One data and water collection is done at maximum depth, the second at mid depth at the third just a few feet from the surface. After all of the data has been collected, the CTD is brought back on deck where we bring the water samples up to the lab to test. It was definitely an exciting day on deck today. It has one week since we left port in Pascagoula and I am having such a great time! I forgot how much fun field work is and how excited I get over the smallest things when it comes to animals. I am so fortunate to have such an experience and I can not wait to get some samples home to share with our students. I already have started making some lesson plans! Lab Scientist is the scientist that stays in the lab to work the computers recording the data on sample time, sample depth and is the one that relays information to the deck personnel about when the nets have hit maximum depth. They keep watch in case anything goes wrong underwater. I woke up this morning excited and ready to go! My morning doesn’t exactly start bright and early at 6am but tends to start much later around 10am. The way life on board the boat works for the team of scientists is that there are two teams: the night watch which is from midnight to noon and the day watch runs from noon to midnight. The field party (that’s what the team of scientists on board is called) consists of six scientists and the FPC (Field Party Chief). I work as part of the day watch along with two of the other scientists. The remaining three work the night shift. Each of the pre-selected stations is about 30 miles apart, so it takes us close to three hours to commute between stations. Once we arrive at the station, all the sample collections and last about 45 minutes to an hour. After we have completed a station we head back into the lab where we have three hours to wait until our next station. During this time we usually watch a movie, read a book, email friends, family or work, do work, play cards, etc. Or in my case, I like to sit out on the deck and look at the ocean since living in Chicago it’s not something I get to see everyday. So this particular morning, I wake up and get dressed just in time for an early lunch before our shift. Today it happens that we reach our station around 11 and since each station takes about an hour, myself and the other scientists from my shift decided we would head up and relieve the night shift early so they can head down for lunch since lunch is only out until noon. Since they had already done the bongo net sampling and preserving, we finished up the station with a Neuston collection. Once we labeled all the samples, I sat down at one of the computers to do some more emailing and started staring out the window in the lab. It was another beautiful day on the Gulf! At least from my perspective it was. What I didn’t see yet on our horizon was a fairly large storm system was headed our way from the Atlantic across Florida in our direction. We arrived at our second station, did our two sample collections and headed back in for dinner. When we got back in, the FPC said that the Commanding Officer (or CO), Lieutenant Commander Brian Parker, said we were going to be heading south to get away from the storm. He said that was our best bet to avoid any bad weather and that the safety of everyone on board is most important to him. We would definitely not be able to hit anymore stations on my shift but we now had the rest of the night off to relax! I have been finding some very cool animals in the samples we have collected! The other deck scientist and I spend more time looking through our sieves to see what caught than we do doing anything else. 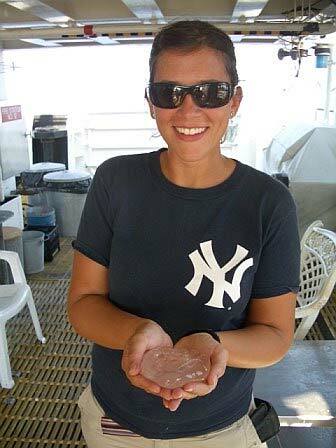 At our first station we got more jellies—and the stinging ones this time! But at our second station, we caught a bunch of juvenile flat fish and eels. And we are getting tons of crabs and shrimp! Little tiny ones! It is still amazing to me the variety of what we are finding and the different colors of everything! Bright blue copepods, orange or purple crabs, purple amphipods, silvery blue and yellow jacks, silvery blue half beaks, yellow and gray triggers, pink shrimp, and more! 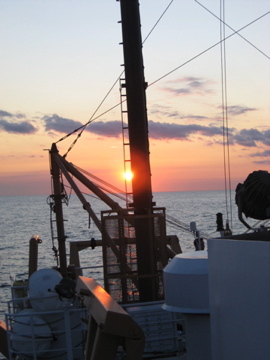 We left port in Pascagoula, MS and headed toward the coast of Florida’s panhandle to begin our ichthyoplankton survey. 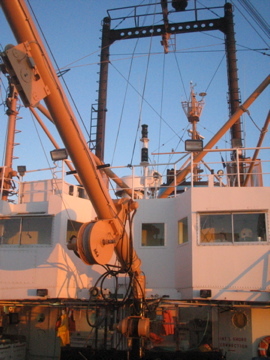 The purpose of the cruise is to assess the abundance and distribution of the early life stages of different fish. 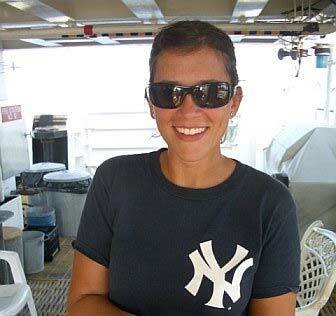 I am part of Leg II of the Fall Ichthyoplankton cruise. Leg I took place the two weeks prior. Throughout the Gulf of Mexico there are 143 pre-selected stations set about 30 miles apart at specific latitudes and longitudes. They spread across the Gulf of Mexico’s continental shelf in water depth of 6 meters to just over 200 meters. Some species we are specifically keeping and eye out for are king and Spanish mackerel, red drum, and snapper. Once we arrived at our first station, I put on my hard hat and got to work. 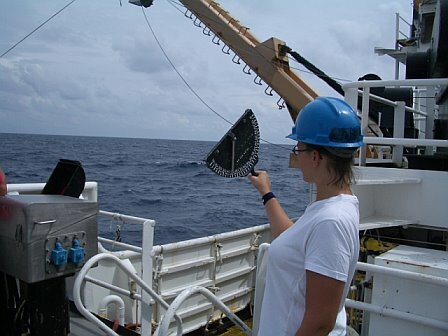 The first sample collected was done using a bongo frame net. This is two circular frames 60 cm in diameter sitting side by side with two 333 micron nets and a weight in the center to help it sink. At the base of each net is a plastic container used to collect all the plankton that can be easily removed so we can retrieve the samples. The bongo net is placed in the water and deployed near the bottom. We don’t want it to hit bottom though! The bongo sampler is towed at a 45 degree angle that I, as one of the deck scientists, measure using an inclinometer and report back to the lab scientist. The time that the bongo is in the water depends on how deep it is at each station. Once the tow was completed, the bongo was brought back on board and using a sea water hose, I rinsed the net allowing all the plankton to fall into the container to collect any plankton caught in the net. I removed the collection container and rinsed the sample into a sieve. Then the fun part! I got to look around and see what we caught. Our first station was full of jellies! I rinsed the samples and placed them in jars to preserve them for identification back at the lab on land. 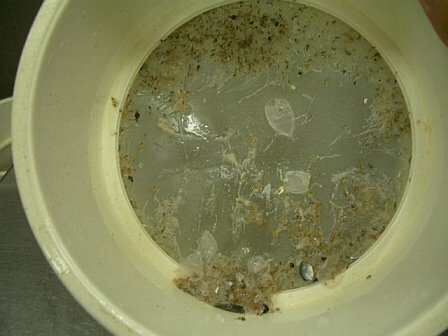 The next sample I collected was done using a Neuston net. This is very different from the bongo nets in that it is one large net 1 X 2 meters with a 947 micron net and we sample only at the surface. The Neuston is placed in the water for ten minutes and then brought back on board, rinsed and preserved the same way as the bongo nets. Once I was done with that I headed back inside where we label everything to make sure all samples have numbers and what equipment was used for collection. I sat down to email some friends back home feeling a little overwhelmed but excited to get to our next station! I am still getting my sea legs and learning as I go. Since today was my first day on deck, everything was very new to me but that didn’t stop me from jumping right in. My fellow deck scientist has been very helpful and patient about teaching me everything and making sure I feel comfortable doing the different tasks. I can’t wait to learn more! Inclinometer is the instrument which measures the wire angle to insure that the bongo nets are at the ideal 45 degrees. What is the meaning of tonnage and range? How fast is a knot when compared to miles?